The Link Light Rail running between Seattle's downtown and the airport sports a fair bit of public art. 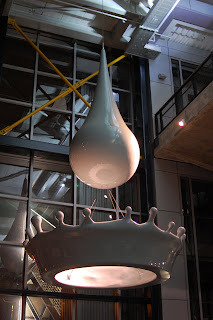 Here at the Tukwila International Boulevard Station is the sculpture "A Drop of Sustenance" by Tad Savinar. It's marvelous, and is big enough to be spotted from SR518 by anyone driving to or from the airport. It easily beats the unmemorable installation in the opposite (outbound) escalator well. I'd prefer if it was just titled "Milk Drop", but my income isn't based on successfully sneaking grant applications past commissioning boards, so what do I know?